Curtis J. Wray MD, MS, attended the University of Louisville and received an undergraduate degree in Chemistry. He received his medical degree from the University of Kentucky College of Medicine in 1998. Dr. Wray completed the general surgery residency program at the University of Cincinnati in 2005. While at Cincinnati, he received a NIH T32 postdoctoral research fellowship. 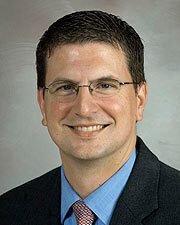 From 2005-2008, Dr. Wray completed a surgical oncology fellowship at the University of Texas M.D. Anderson Cancer Center. In 2008, Dr. Wray was appointed Assistant Professor of Surgery at UTHealth. His research interests include clinical outcomes for gastrointestinal cancers as well as cancer-related health care disparities. These research efforts have led to 52 peer-reviewed publications. These work led to a successful application and grant funding from the American Cancer Society to investigate clinical outcomes for Hepatocellular Cancer patients. In 2013, Dr. Wray was promoted to Associate Professor of Surgery at UTHealth. He has also recently received a Master’s Degree in Clinical Research from UTHealth. Dr. Wray belongs to numerous professional organizations including the Society of Surgical Oncology, American College of Surgeons, American Association of Cancer Research, Society of University Surgeons, American Society of Clinical Oncology, Society for Surgery of the Alimentary Tract, Association for Academic Surgery and the American Hepatico-Pancreatico-Biliary Association. Dr. Wray has served as Cancer Liaison Physician for Harris Health System and was recently appointed to the American College of Surgeons Commission on Cancer. Currently he is President of the Houston Surgical Society. Areas of clinical expertise include traditional open as well as minimally invasive surgery for gastric, liver, pancreas and colorectal cancers.